How long to leave pup with a trainer? I got a GSP in July and dropped her off with a trainer in August, she was right at 5 months old then. The guy still has her and is wanting to keep her through November. When I dropped her off, he told me that exceptional dogs will be ready in 2 months, some will take 4, and some never make it. The guy charges $550 per month, and is training quite a few other dogs at the same time. He runs a highly regarded quail hunting operation, one of the best in my state, however I never heard from anyone that used him for training. I’m curious, is this typical? The training is getting to be a bit more than I was expecting, money wise, so my expectations are getting higher. I’m worried I will be disappointed when I pick her up. I'm getting bad vibes about this. The trainer I used would update me every 2 weeks on where the dog was in respect to its training goals. You don't want to keep putting out the money and have no idea what progress is being made. Are you able to visit and see what progress has been made? I’m not really able to visit. It’s a bit of a drive, and he wanted to give her a couple of months before I check on her progress. What should I expect from a 8 month dog after 3+ months with a trainer? I know what he told me to expect, but im curious if it’s in line with what you guys would expect. And in the worst case that I pick her up and it doesn’t look like anyone has been working with her, what recourse do I have? First of all what did you expect from a 5 month old pup. There is no reason for a trainer to keep a pup that young over three months. I would pick up your pup, if the result is not up to your expectations count it as experience and go on. After that length of time unless this dog has derby quality and is close to being broke on birds you have likely wasted your money and time away from your pup. By 8 months of age all of my GWPs would retrieve shot birds to my hand or my feet, would search cover hard and fast, point birds and hold their points sufficient for me to flush and shoot the bird, hunt dead on command diligently until the bird is found, track wounded birds as needed, jump up and load into a kennel carrier in the back of the truck, retrieve bumpers and birds in water and through decoy spreads, sit, stay, heel, whoa (not around birds), recall on a run to voice, whistle and tone on the ecollar. I train them myself starting the day they arrive. A competent pro trainer should be able to accomplish the same, with the possible exception of the retrieve to hand depending on your puppy and what has been done with it up to this point. I get my puppies retrieving to hand starting within a couple of days of their arrival at 8 weeks and keep developing their natural retrieve from that point forward. If your pup has had none of that it may lag in that area and it is too young to put through a FF program, so not sure how that will turn out in the short run. All the rest is doable. But I am also unsure if it will be done as a pro trainer is hard pressed to have the same relationship with the puppy as I have with mine, nor are they likely to spend as much time with it as I do with mine. But well bred puppies are capable of the above by 8 months of age. All the pro trainers we deal with have a puppy program, that lasts one to two months and is about basic obedience and bird introduction. Not saying your trainer is wrong but I would certainly visit the dog and see what is going on. What is the dog supposed to be ready for when the trainer is done. She would be very young to be a finished dog. If it is obedience training, saying some never make it should be a huge red flag. No idea why a 5 month old dog would need 4 or 5 months with a pro. I would go see the dog, maybe even unannounced, and see what is going on. Don't expect a 7 month old finished dog. But basic obedience should be good. I would very likely pay the guy off, bring the dog home, get to know him and if you need a trainer find one when he is about a year old. It seems like this dog has spent a good part of is life in a kennel already, without much socializing. With a 5 months old pup or even a 7 month old pup, I wouldn't be doing any serious training. I'd just get the recall to voice and whistle well under way. Train it to sit to voice and to whistle when it is close to me. Give it some run-in type retrieves and try to have it find and probably chase a few birds if possible. That can be easily done within two months if the pup is even moderately straightforward. I'd be more than a bit suspicious of a trainer who wanted to keep the pup longer than two months if all that was being done was the things I just mentioned. Most folk could easily train all of the above themselves....and do it all in less time. I would contact the trainer and ask exactly what the pup is now doing and ask about any problems encountered. If I still did not feel reassured I'd go and get my pup back. I can only speak from having my retrievers trained. I agree with most that 2-3 months of basic obedience training is plenty and a 5 month old pup ,typically, is not yet ready for more. That being said, what level of training are you going for? With my first two Golden's I wanted them to be trained through the Junior Hunter (JH) hunt test level, so I could run them on the hunt test and they would be ready. I also always expect the trainer to train me on how to handle the dog. Usually that is 2-3 days when I would drive up to work with the dog. These are important as each trainer does things a bit different, here Is where you learn it. The last day was usually when I was picking up the dog. By the way a JR dog has learned marking a fall, lining a mark on retrieve up to 100yds. taking a straight line to a fall crossing obstacles water, water to land and back to water, etc. line must be streight, healing at the line (hopefully steady), and recall to whistle. Not yet fully finished but in good shape for hunting. This process usually took 2-3 months. My last Golden I had trained as a finished retriever learning all noted above, plus taught to handle to a blind fall using whistle and hand commands. Also, this training stretched the dog out on retrieves/ Marks going out to 150yds to 200yds.. Additionally, they were taught to solve many problems and challenges such as lining a blind retrieve across the line of a prior mark. These Senior Hunters are fully finished hunting companions and can easily pass the AKS SH tests. This usually takes 9-12 months in total going back to beginning at JH level. It is not an inexpensive process, but working with a good trainer, it is amazing what they can bring out in a well bread dog. What feedback have you had from him about progress? Did you talk about goals and what he thinks he can do and/or what you want done? Personally, I think that a huge problem folks run into is they don't have specific goals for the training, which can lead to miscommunication and disappointment. For example, I interviewed one trainer who said, "We'll get him loading up in the truck and pointing birds and make sure he likes to pick them up..." Well, the dog already pointed, and liked picking them up and carrying them. And why would I pay someone to teach my dog to get in the car/truck? I threw a hotdog in the truck bed and patted the tailgate. He already got in and out of the car regularly. He was working on her holding point longer, and said he was having to go a bit slow with her. When I dropped her off, he asked if he could use her on a few of his guided hunts to help finish her off. He offers it to everyone he trains for, but it’s at the owners risk. The last time I spoke with him, he felt she would be ready for a few hunts by next month. 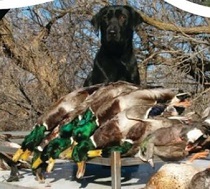 My expectation is a very well started dog that is ready tostart hunting. My question is: Why are you taking a 5 month old pup to a trainer in the first place? Like others have said, it's way too young for any serious training. You still haven't told us what your expectations were when you took the dog to a trainer. At 5 months I would be more concerned about teaching the dog some basic obedience. There is no substitute for good obedience and it's better to do it earlier than later. Are you unable to do your own obedience training? Is this your first hunting dog? A 5 month old puppy is ready for all kinds of training. Provided the methods are correct. Say nothing to the trainer about the fact that you are coming down...just go there and get your dog. Before hunting season starts. As others have said...there is nothing a pro trainer can teach a 5-8 month old puppy that you could not have taught the dog yourself. But what is done... is done. 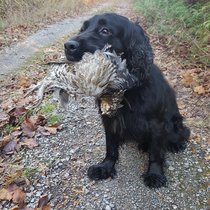 I strongly suspect that the dog will get less and less training attention as the season approaches, and very little during the season simply because the quail hunting portion of the business will take first priority. it is exactly the same as when using a field trial pro for training. During the field trial season...very little actual training gets done because the pro is on the road competing. You can find out where the dog is, training wise, in an hour or two at the trainers and build on it from there. But you need to get the dog home and bond with it. Soon. Then take it hunting, with a gun if the dog has been gun conditioned or without, if it has not. The birds and the time in the field will do a lot for the dog. After this season, if you wish to put the dog back with the same trainer, by all means do so, if you are happy with what was done. By then the pup will be a tad over a year old and ready for steadying and such. Getting a dog steady to wing and shot is where it really pays to use a good pro. They can do in two or three months what most amateurs take a year or more to do, because they can work the dog every day, even twice a day on birds. If a pro cannot get a 15 month old dog steady to wing and shot in three months... again...go get the dog because something ain't right. Lots of overreactions in this thread with an accompanying lack of facts/information. By all means go check on your pup and see what is going on. If concerned as to what is and is not being done with the pup then bring it home. But I assume you did not want to undertake OB training, Bird and Gun introductions, get the pup Searching and Pointing etc or you would have never taken the pup to the trainer in the first place. So bringing the pup home and doing nothing with it is not at all a good alternative on the other side of this. Unless you are prepared and wanting to work with the puppy someone needs to. Whether this trainer is the right person or not, none of us have sufficient information to say at this point, is my input. A puppy program is just that, a puppy program. At five months a pup is too young for a pro to train but they can develop the pup. Subject it to a lot of birds, get it in the water, work it in all types of covers. Let it range and get confidence. Then, at 8-10 months the pressure work can start if that's what you want. By pressure I mean formal obedience, force fetch, electric collar breaking, etc. Pup's never fit my program so I wouldn't take one until it was eight months old. I could do everything with a pup from 8 to 12 months that a trainer could do keeping one from five months on. As far as I'm concerned, puppy program's are a total rip off unless you have no access to birds or training grounds. Just read your last post about the trainer wanting to use your dog for guided hunts. You do what you want, but there is absolutely NO WAY I would allow one of my dogs to be used as a guide dog at ANY age, and certainly not a green puppy that is 9-10 months old. Way too many things that can go wrong. You said the trainer was in the same state. If it is a 4 or 5 hour ride, that is one I would take. Sounds like a line of BS from the trainer. No one in his right mind would use another person's semi-trained, pup on a paid guided hunt. Sounds to me like the trainers trying to schmooz the owner into a couple extra months training. I agree with Avergeguy and Trekmoor - a LOT can be done training-wise with a pup at 5-6 months of age. Done properly, you end up with a fully formally-trained dog at or even before 1 year of age! Dogs are very capable of this. As already stated, there has been a bit of over-reaction, also in my opinion. There are too many unclear items needing answered. As for the guiding, this can really round out a trained dog by exposing that dog to "stuff" that can happen when hunting and how to best address these challenges. No....I personally don't do that but I don't guide. 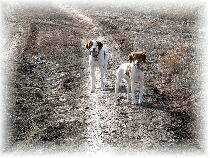 I have taken some client dogs with me on wild bird hunting adventures - only the rare lucky dogs! I do this to take dogs to the next level pursuant to completing the formal training. Yes, you should go down and meet with the trainer, spend a 1/2 day there and not just with your dog. Sometimes YOU can learn a great deal from a decent pro in terms of handling dos and don'ts. What I am unclear about is why the trainer (or trainers in general) deny you coming by to see the dog? Now, I'm not suggesting an owner visit every Monday, Wednesday and Saturday but there should be nothing you can't see, or for that matter help with, but that's just my take. Finally, some of your concerns regarding what to expect and what the dog's goals are, required clarity at the forefront. Or, perhaps they just weren't as clear as you are now hoping they were. ?? Bottom line is, what is your dog capable of today and how far is his training from your communicated aspirations? Price/cost is again something you should have had an idea about going in or at least with clear parameters. Forget cost. Think value. Last edited by Featherfinder on Sat Oct 27, 2018 8:25 am, edited 3 times in total. birddogger2 wrote: I'll cut to the chase. Concerning the $550.00 per month. I would also be suspicious. That is what I charge 20-25 years ago. $550.00 month is basically a boarding fee. When I retired I was charging 700.00 plus bird per month. IMO the cost per month has little to do with it. Around here $550 is just about the going rate; my current guy charges that and it includes birds. OP, do you like the trainer, like his kennel, and like the way his dogs work? Have you and he chatted about expectations for the dog? I were you, I'd pick up the pup, and tell him thanks but no thanks, see ya next summer. That's just because I like having my pups home and have the resources to mess with them myself. An unannoumced visit may or may not be informative. What if he isn't home, will you break onto the kennel to get the dog? What if he is booked with other clients and can't take the time to show your dog and give you some hands on handling/training time? Common sense should tell you that if the kennel is filthy, if the dog is uncared for, if the dog hasn't been worked with, a few hours notice to the trainer isn't going to give him time to correct any concerns and pull the wool over your eyes. I've had experience with 3 pros. None of them was particularly communicative;) generally I'd be the one to call ( and at times recall and recall). The guys would like to keep working with promising young dogs and send them home only when they needed to shut things down for the season. If a young dog wasn't doing very well, the trainers would let me know and encourage me to bring the dog home for a while and try again when the dog had matured a bit more. But these were trainers I kind of knew, had observed at competitions, and therefore generally trusted. Hopefully you had checked out your guy prior to sending off your dog. I hope everything turns out well for all involved. If things aren't good you've learned a hard lesson but nonetheless have your dog back. If all is well, you now know about being on top of communicating with your trainer. Best wishes. As far as the price goes, I do agree with Shags that it seems reasonable, especially if there are game birds involved, because that is where the expense starts to grow. In my area there are several highly successful American Field trial trainers who charge in that area per month. As I mentioned, they do the bulk of their training during the summer months and work predominantly on pigeons in the early stages of steadying and such. 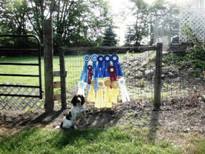 It seems that the AKC Field trial trainers I know do charge more in the $700 range per month. I do not know why, but it seems to be the case. Good luck with your youngster. Great...now there is a consensus that the price is fair. What about what the OP got for that $$$? If the pro is asking to hunt the dog (a compliment in my opinion), I'm assuming the dog holds point but to what extent - to the flush, to the shot, to the fall? I'm assuming the dog retrieves - does he, mostly, to the general area, to your feet, to hand? Does he handle or does he need to be whistled and hacked around a course/field (not great for wild birds but....)? There is so much to know before throwing this pro under the bus, as some already have. I'd call this pro up, arrange a visit, see for yourself where your dog is at as well as getting answers on the aforementioned items (to name just a few) along with handling tips, etc. Heck, I had a chap come by with a GSP that was fully trained at just over nine months invite me on a hunt to a game farm because he felt his dog was becoming a bit hardmouthed. When we started out, this chap pulled out his camo 12 gauge semi. Of 5 chukars collected, 3 went directly into "fertilizer". The remaining two had somewhat edible parts. I'm guessing that if you make your game birds "canine table ready" when you shoot them, you just might end up teaching your dog to have some on the way back from a retrieve. Lesson learned by owner....in the field while hunting. At this point, the OP should ponder value of which price is but one - albeit weighted - aspect of the equation. There is SO much more! Since this is an Open forum on the Internet . I was wondering ,what the chances were that the Trainer would see the Post made by Cbf89 ? although incognito , it wouldnt be hard to figure out . If I was the Trainer , I sure would be wondering why there is more dialogue between the client and strangers ....than me ? polmaise wrote: Since this is an Open forum on the Internet . I was wondering ,what the chances were that the Trainer would see the Post made by Cbf89 ? although incognito , it wouldnt be hard to figure out . I searched for the trainer on here before I dropped my dog off and found nothing, I was hoping for reviews. Anyways, I’m not calling the guy out, simply asking what is considered normal and if this situation is suspect. Surely he doesn’t expect everyone he works for to have blind faith in everything he says. 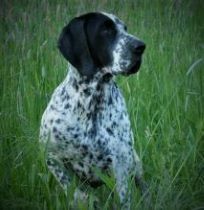 Cbf89 wrote: I got a GSP in July and dropped her off with a trainer in August, she was right at 5 months old then. The guy still has her and is wanting to keep her through November. When I dropped her off, he told me that exceptional dogs will be ready in 2 months, some will take 4, and some never make it. What concerns me is wether you are letting this pup have enough time to be a pup. If its a puppy program, 3 months seems a bit long. I won't send a dog to a Pro for regular breaking untill they are around 18 months old. But that's just me. I know it’s been a while, but I want to give an update. The trainer called me about a month ago and said he was having some trouble with her and needed to keep her longer. The trainer still has her, wants to keep her another month or so, but is no longer charging me. Keep in mind, I paid nothing up front, all training costs are due when I pick her up. 1. She’s not hunting. She stays by his side, and won’t get more than 10-15 yards out in front of him. This is the trainers biggest frustration with her. Even when we were standing in the field talking, she was full of energy but wouldn’t venture off. He said when he runs her with another dog she will get out and hunt with them but if no other dogs are around she wants to stay by his side. 2. He planted 7-10 birds for her to hunt, and most of them she wouldn’t really leave his side. For 1 specific bird, she was about 20 yard from the trainer when she smelled it. She immediately ran back to the trainer and went on point from 25 yards away, from the other side of a ATV. He thinks she just needs confidence and field time. She’s not gun shy at all, and she’s retrieving (not alway to hand but she will at least drop the bird at your feet). His place has plenty of birds. Went went to the field behind his kennels and he got her out and started walking her around, she went on point. She held point for a few minutes then ~30 birds flushed. I will never be able to get her on birds like that on a regular basis. I'd go get her and begin working her like she's a pup. Lots of happy timing and walks with no pressure. To me, what you describe, is a young dog that's had entirely too much pressure at a young age and is scared of messin up. Some dogs take the early pressure better than others. You don't need that many pen raised birds to make a bird dog, but it's hard to make one that has no confidence. If you took some video and posted it we would all be in a better position to offer better advice but something is not going well at this point based on what you have shared. A pup that age pointing and holding for several minutes sounds very good, but not wanting to get out and hunt actively for birds in a field where it has found birds before concerns me. A pup that age with prior bird exposure should be ripping up a bird field hunting for birds. Often the price one pays for a an expectation is higher than what one expected to pay . Is your trainer heavy into control and obedience? That can shut down a dog, especially one that isn't naturally bold. Does your trainer nag or hack? That can be intimidating. I'd bring the dog home for some R&R, then find another trainer. Something's not clicking between your current guy and your dog. Try to get your hands on the current issue of Pointing Dog Journal. It has a good article about slow starter dogs and how to bring them along. Keep in mind that you need to continue the training once you get them home.